Crock pot and one dish meals are among my personal favorites! With both kids in sports and school activities, some nights by the time we get home it's too late to prepare a meal. My crock pot and Fagor cast iron dutch oven are two of my favorite cooking instruments! The Fagor enameled cast iron dutch oven is great for creating hearty stews or slow cooking beef and pork that are saturated with moisture and flavor. This dutch oven has an extra heavy lid and is designed to go from the stovetop or oven to the table. The Fagor enameled cast iron dutch oven comes in three stylish colors: blue, rioja (deep red), and lemon-lime. It also includes a collection of delicious and mouth-watering recipe card specifically designed for the Fagor Oval Dutch Oven. In the last week, I have used my new dutch over three times. I've cooked a homemade stew, beef roast with potatoes and vegetables and a ham. All three dishes were amazing, moist and full of flavor! Clean-up was quick and easy. I was very impressed at how quickly and easily I was able to wash it - it was effortless! This dutch oven is strong and durable. It is clear that it was meant to last and will be in my family forever! This dutch oven is the perfect addition to any kitchen, and would make the perfect wedding or housewarming gift. Do you cook using a dutch oven? 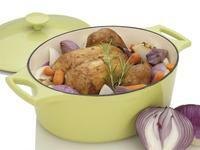 I don't own a dutch oven but it seems very durable and great for a lot of delicious meals! My husband loves to cook and he has a collection of pots. I am sure he would enjoy using this one. This is the one cooking dish I don't own! And it seems like it would be perfect for the kind of cooking I do! Im loving the bright colors too! Wow, that sounds fantastic! I'd love to get a dutch oven. I want a dutch oven bad!! This might be the one I get. I could use a nice dutch oven as they are so versatile. Boiling, roasting, braising and even baking bread. Thanks for the review, I will have to put this on my list for Santa! I would love to have one of these, they look great and I can just imagine all the recipes I want to make. My mom really wants one of these. I am trying to win her one. Lol!